Ah, beautiful Allihies! I was going to make one blog entry about Allihies, but it is turning out to be impossible.This little seaside village has so many personalities it’s difficult to know where to start. The town is lovely and the beach is stupendous, but you can’t go walking in those inviting hills unless you travel the carefully laid out roadways. Once properly known as Cluin, Allhies was a thriving copper mining town, the landscape now dotted with dangerous, abandoned mine shafts. We made our way over Knockgour Mountain and drove down through the mist towards the village. If you look carefully at the picture above you will be able to see the beach tucked below Ballydonegan Bay, a lovely bright half-moon in a rugged landscape. The road twists and winds through rocky hills until you come upon a blue sign at the side of the road explaining a bit about the history of the area. Copper mining at Allihies started here in 1812 by John Puxley, a local landlord, after the large quartze promontory to the left here was identified as copper bearing as can be seen by its bright Malachite staining. Initial mining began with a tunnel or adit driven into the quartze lode from the beach below. In 1821 two shafts were sunk as can be seen either side of the road here. Flooding was a continuous problem and in 1823 the engine house was erected to house a steam engine brought over from Cornwall to pump water from the depths. The remains of this building with the base of the chimney can be seen across the road.There is also evidence of a steam powered stamp engine to the left of the chimney and dressing floors in front of the engine house. The high dam further inland is the remaining evidence of a water reservoir which stored the water that was pumped out from the bottom of the mine. It was used for the steam engines and needed to separate the copper from the rock.All the rubble on the cliff at the sea side of the road is the crushed useless quartz rock elft over after the copper was extracted. This is one of six productive mines in the Allihies area and continued its operation until 1838 when it closed due to failing ore. The view from this spot was vertigo inducing as deep crevices were visible plunging into the sea below. One could only imagine the danger and the struggle families went through in the area as they tried to battle nature for her treasures. It’s amazing to note that copper mining in this area had begun before the Bronze age finally reaching its peak in the late 1800’s! After the decline in production,emigration took its toll as miners left the area in search of a new future, leaving Allihies virtually a ghost town for decades. Haunting looking structures loomed up through the mist, guardians of the past. We learned that one of the structures has been restored and was named,”The Mountain Mine Man Engine House”. Would you like to learn more about Copper Mining in Allihies? This entry was posted in Allihies, Beara Peninsula, County Cork, Ireland, Mining, Ring of Beara and tagged allihies, Beara Peninsula, Cluin, copper, copper mines, mine, quartz, ring of beara, Slí Mianaigh Umha Na hAilichí. Bookmark the permalink. Superb post and photos. I had no idea there were mines like that down in Cork. Reminds me of what you see a lot in Cornwall. I have to get down there and do some paintings. I love the old early Victorian industrial buildings.The little map is a super touch. 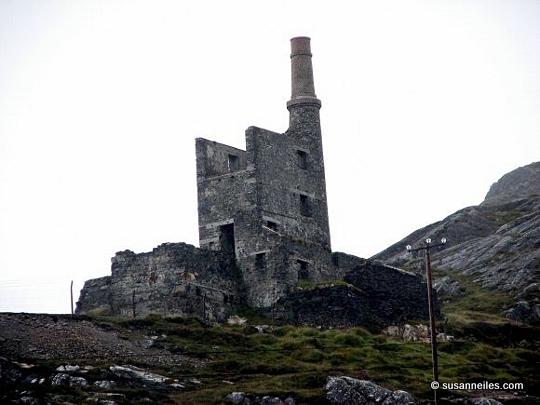 Hi – not only was the mine engine and pumping house design imported from Cornwall but Cornish miners as well. I believe that the building that houses the museum was a chapel built for the Cornish miners as they were Methodists. Hope to get to this incredible area soon to follow in the footsteps of my Cornish tin mining ancestors, and drink a few beers with my Celtic cousins ! “The Mountain Mine Man Engine House is unique in Ireland and it is the sole remaining purpose-built man engine house anywhere in the world. Not quite true, it might be unique in Ireland but we have loads of man engine houses in Cornwall. I found one near Wrexham in North Wales and there are plenty more wherever the Cornish went mining around the world. @Nigel..thank you for your comment. 🙂 I should have worded my writing a little more clearly. 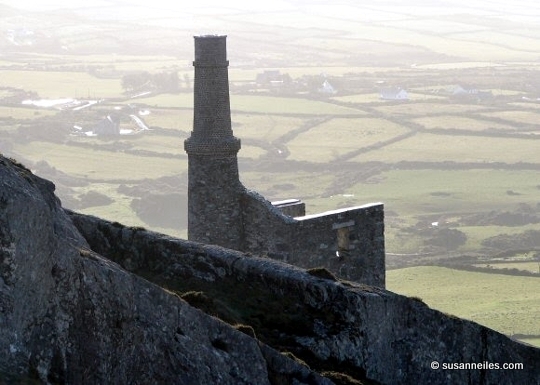 This lone sentinel is unique in Ireland as it is based on Cornish design, whereas other man engine houses have entirely different construction. Susanne – no problem. It really pleased me when I found out that my tin mining ancestors had got to Ireland. Next year I will visit hopefully, with the old engine house and the rocky Atlantic coastline it will be just like home. Would be great if the locals know how to make a decent pasty !